Description: Gray wolves have a long bushy tail that is often black-tipped. Their coat is normally a mix of gray and brown with lighter facial and underside markings, although coat colour can vary from white, to dark brown or black. Males can weigh over 70 kg (150 lbs) with females weighing slightly less. 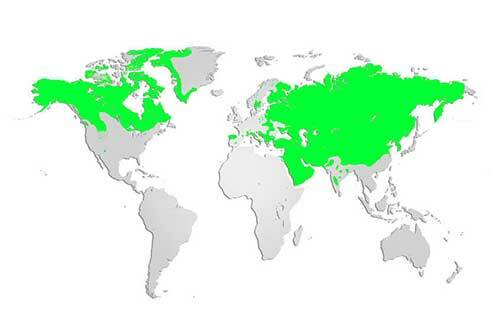 Distribution and Habitat: The gray wolf (timber wolf) was once widespread across North America, but was removed from most of its range (extirpated) due to over-harvesting. Today, the gray wolf is making a come back in some of its former habitat because of strong conservation efforts. Gray wolves are no longer inhabitants of Nova Scotia, but are found in other areas across Canada, generally in northern, sparsely inhabited locations. They can live in diverse habitats including woodlands, forests, tundra, deserts, and grasslands. Diet: Carnivores, gray wolves hunt in packs, cooperating with one another and taking turns chasing a prey animal until it drops from exhaustion or is driven into an ambush. Typically, gray wolves hunt large herbivores such as moose, caribou, mule deer, white-tailed deer, muskox, bison and mountain sheep, but will also eat smaller mammals and fish. 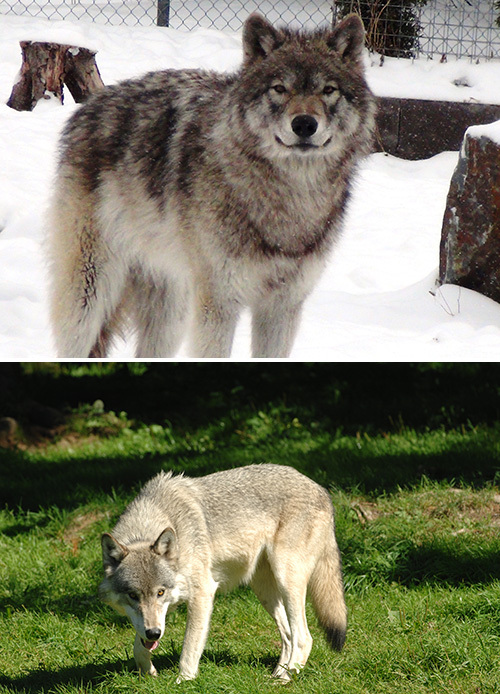 Life Cycle: Life-mates, gray wolves breed during March/April. Females deliver, on average, 5-6 pups after a 9 week gestation. Young wolves remain in a whelping den, located in a secluded area, for at least a month, venturing outside as they grow. The entire pack may reside there, with adults taking turns babysitting while the others hunt. By mid-autumn gray wolf pups have joined the pack, helping hunt alongside the adults. Adaptations: Wolves have developed complex social behaviour in their pack hierarchy, communicating through body language as much or more than through vocalization. Packs function together far more in the winter; in summer, gray wolves usually separate into singles or pairs to hunt. Did you know? Wolves put a great deal of effort into hunting and although they are very smart and work well together, they are usually successful only once in every 10 hunts.